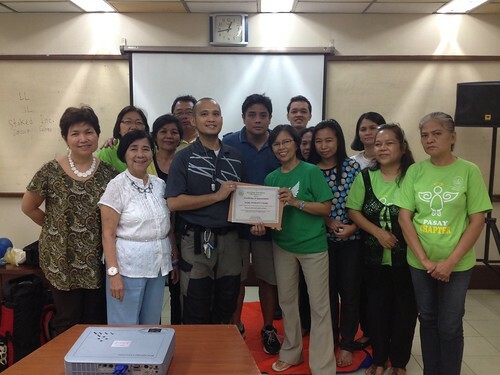 The Autism Society Philippines conducted a seminar, entitled “Emergency Skills for Families with Autism.” The seminar was held at Conference Room of Philippine Information Agency Visayas Avenue, Quezon City last August 30, 2014, attended by parents and professionals. The seminar regarding Emergency Skills for Families with Autism was facilitated by Mr. Mark Anthony Padil, founder of the eMergency Autism Response sKills (eMark) Services. Mr. Padil discussed most of the important things that each of individual do when we encounter a disaster whether it is a natural or a man-made disaster. He share to us the important things that we should prepare in case there is an emergency. He shows samples of what’s inside of a disaster supply kit should be. Mr. Padil also demonstrate different kinds of first aid in every type of emergency situation. The demonstration made the participants understand better how important to have a knowledge about first aid especially if there are emergency situation. As Mr. Padil is also an expert in handling children with autism he shares that CWA should also be trained in different kinds of emergency sounds to help them to be calm during emergency situation. He mentioned that as a first aider we should be calm and know the situation first before doing anything. Participants shared their thoughts about the seminar.